Hey Ladies….Are you prepared? Hey Ladies….Are you prepared? Great question right? I originally came from New Jersey, so all I had to worry about was storms, floods, maybe a tornado or hurricane warning. I would always keep some water in my car but that was about it. Well, moving to Southern California was a little more eye opening because of the dreaded earthquake. Apparently you have to be prepared because we can break off and become an island at any given moment. I got myself a rather large bin and still kept some water in my car, but now I added some snacks, some money, a few other essentials just in case. This box took up half my trunk space. There had to be a better way. 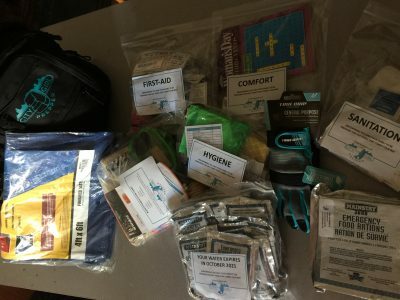 Well, my husband who I occasionally refer to as a crazy prepper, shows me his bug out pack. Here I am thinking, how nice for you, glad you have one and you’ll be safe. While he was participating in a preparedness fair, he met Jennifer from City Girl Prepper. She’s a busy mom of four who believes that being prepared for an emergency is the key. She’s had Community Emergency Response Team Training. 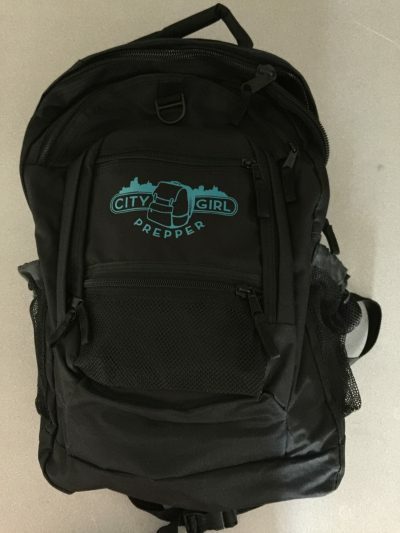 She offers “Survive in Style” parties and, through her, you can even become a City Girl Prepper Preparedness Coach. I emailed Jennifer and she was kind enough to send me her 1 person 3 day backpack. First aid kit includes: 30 band-aids in various sizes, 2 pair non-latex gloves, gauze pads, alcohol prep pads, Butterfly wound band-aids, sting relief pads, ice pack, self adhesive sports tape, triple antibiotic ointment, surgical scissors, tongue depressors, anti-diarrheal medicine, allergy tablets, pain reliever/fever reducer, Splinter-Out tool. Like I said, this thing is packed. There’s some space left inside where you could probably fit a sweatshirt or non bulky jacket. You should also hide some cash in the extra pockets. It’s heavy but comfortable. I mean as comfortable as a full pack can be. I put it on my back and walked around the house with it, and I had no problem. I feel much better knowing this is in my trunk. If we brake down somewhere, we’ll have water, snacks and first aid supplies until help arrives. It hardly takes up any trunk space. You could even just keep a few in your house incase you needed to leave in a hurry. 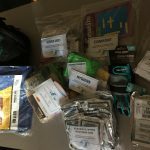 Think about what would happen if you had to get out quick in an emergency, would you be able to think straight in order to pack a bag, a few essentials for yourself or your kids? Well, now you can just grab the pack and go. This particular backpack sells for $130. Well worth the price when you consider the piece of mind you’ll have know you have this in your car, or your children’s cars. If this pack is not for you, then take a look because this is not the only backpack Jennifer offers. 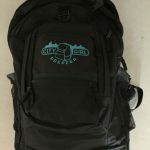 She also offers; 2 person 3-day backpack, Mini First Aid, City Kid, Student, Teen and Dorm, a Pet backpack and more. You can find all these packs and more on Jennifer’s website. These backpacks are a great gift idea! To order, please contact me at kimmieskubby@gmail.com as I am so impressed with these that I have become a consultant!